View letter from your Director, Steve Toole and learn about: benefits, premiums, contact and how to enroll. This is your resource for important information about your supplemental benefits. Proper dental care is important. That is why it is so important to have a dental plan that covers preventive, basic and major services. An eye exam can help identify not only eye and vision issues, but systemic disease. Exam, lenses, frame and contact lens coverage included. There is a new identity fraud victim every 2 seconds. Identity theft protection helps protect against damage to your finances, credit and reputation. 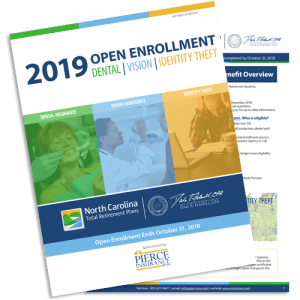 Pierce Insurance will mail you an enrollment book that summarizes the supplemental benefits that are available to you as a retiree with the North Carolina Retirement Systems. To obtain identity theft protection, dental and vision insurance you must complete the enrollment process within 60 days after you have received your first retirement benefit payment. You may enroll in identity theft protection year-round. 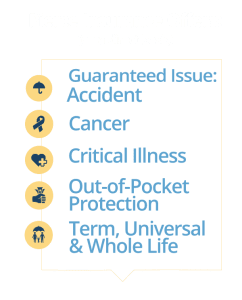 Are you a current policyholder for Life, Accident or Critical Illness and need to access service or claim forms?